Turnover Frame & Adaptor for Trent 900 HPC Design. The frame is designed to securely hold and manipulate engine components. It has been fabricated from 100mm x 50mm box section for the base frame and 5mm laser cut plates for the locating section. Contact faces are lined with nylon 6 to prevent metal to metal contact. To rotate the fixture a customer standard manual gearbox has been fitted. To manoeuvre the frame it features 4 off 200mm castors, 2 off fixed and 2 off swivel with brakes, these all have blue elastic non marking tyres. 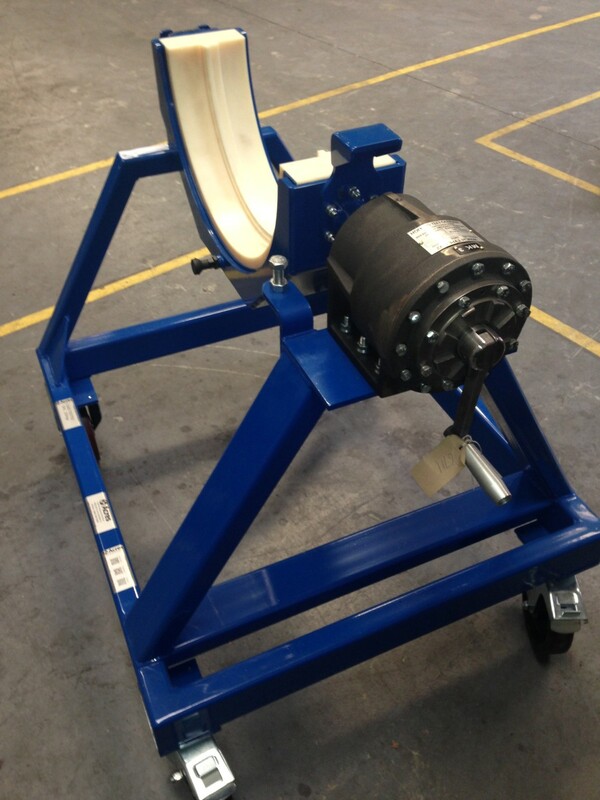 The turnover frame adaptor has been manufactured from nylon which allows the use of existing handling equipment rather than having to purchase new bespoke equipment. Interchangeable tooling reduces continual tooling costs and also increases available space. The entire unit has been load tested to 250 kg SWL. The frame has been powder coat finished in BS 4800 20-D-45 Blue to give a hard wearing durable finish. The adapter has been requested in a self colour natural finish. Approximate overall size – 950mm (W) x 1000mm (L) x 970mm (W).